Climate Camp protesters have made energy giant BP their latest target by protesting against its plans to extract oil from tar sands in Canada. BBC News found out why. Outside a smart, if anonymous, London office building is the last place you might expect to find an indigenous Canadian singing a traditional sundance ceremony song. But the reason for Clayton Thomas-Muller's presence in St James's Square, a short walk from the bustle of Regent Street, soon becomes apparent. "When I say 'BP', you say 'criminal'," he implores the 200 or so onlookers, who duly oblige. The location is the energy giant's HQ. His claim, that it is poised to begin extracting oil in a way that will destroy his homeland. 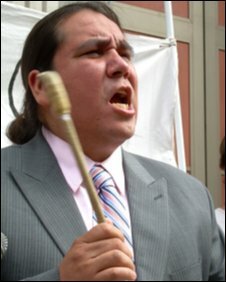 Mr Thomas-Muller's indigenous name means Strong Thunderbird Man, he says, before delivering a rousing speech in the style of an evangelistic preacher. His audience are from the Camp for Climate Action which has spent the past week rallying over environmental issues at Blackheath, south east London. When they pitched their tents, few had heard of tar sands. But by Tuesday lunchtime they are clutching banners and placards in protest at its extraction. "Tar sands oil is blood oil," reads one. Another: "Tar sands = dirtiest oil on Earth". Their complaints refer to the digging of bitumen from an area they compare to the size of England, in Alberta, Canada. It is big business in the region, with output expected to triple by 2020 with oil firms turning to it as stocks decline elsewhere. In 2007, BP entered a joint venture with Canada's Husky Energy aimed at producing 60,000 barrels a day from 2014, rising to 200,000 barrels over time. The Canadian Indigenous Tar Sands Campaign, which Mr Thomas-Muller represents, says the process produces three to five times the volume of carbon dioxide per barrel as conventional oil production. Separating the tar from sand uses the same volume of natural gas per day as heating 3.2m Canadian homes for a year, the group claims, and that is before it is converted to oil. Some forms of extraction also create huge tailings ponds - stores for toxic waste made up of water, clay, sand, residual bitumen and heavy metals. George Poitras, of the indigenous Mikisew Cree First Nation, claims leaks from these ponds - along with legal effluent release - have a serious environmental impact. "We're about 250km downstream from tar sands activities, on Lake Athabasca," he says. "Our traditional hunters and trappers have noticed that water levels have receded and fish are diseased and have blisters or mutations. The taste of animals is different and their flesh is discoloured." Mr Poitras says his people are increasingly afflicted with cancers. "In a community of 1,200 people, we have buried over 100 since 2000. This is not exaggeration. Our community is in a state of constant mourning." He says these concerns are being ignored by Alberta's government, eager to promote the economic benefits of tar sands extraction. The authorities say levels of hazardous chemicals or metals are naturally present in the Athabasca River region. Samples taken downstream of developments show contaminant levels no higher than other non-industrialised waters in the region. Water use is restricted and that seepage from tailings ponds is closely monitored, along with deformities in wildlife. No ill-effects have been noted, they say. Similarly, a study in Mr Poitras' Fort Chipawyan home in 2006 showed no increase in the rates of cancers or other illnesses, the government adds. Even so, protest organiser Jess Worth believes there is little to defend the tar sands extraction at a time when cutting CO2 emissions is high on the global agenda. 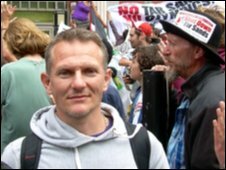 Co-editor of global issues campaigning magazine New Internationalist, the 34-year-old from Oxford was at a conference in Alaska when she heard Mr Thomas-Muller give a five-minute speech. She had only "vaguely heard" of tar sands before but she was soon convinced of the arguments. Six months later, she found herself introducing the speaker and his delegation to the climate camp. While acknowledging that BP is no major player in the sector, Ms Worth says they are targeting the firm because it is still considering its options. "We have an opportunity to stop it before it starts by putting pressure on in the UK," she says. Ms Worth believes it will be six months before BP makes a final decision on whether to proceed with the project and says public protests and lobbying of shareholders will be organised. 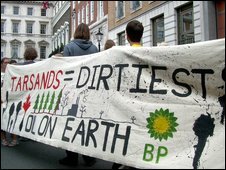 A single slogan reading "No Tar Sands" daubed on a door to the BP offices [and later scrubbed off under police supervision] is the only sign of direct action in St James's Square. But Ms Worth said more can be expected. For the time being, the protest is restricted to good-natured music and dancing. Elderly hippies sway, Woodstock-style - arms aloft and eyes closed, alongside younger companions weather beaten from a week under canvas. There appeared to be few present not already convinced of the green argument. However, science teacher Chris Lawrence, 42, did interrupt his journey home to Kensal Green, north west London, to find out more. "I knew nothing half an hour ago," he admits. "But I can't understand why they are still digging the oil up. It's quite soul destroying." BP says the project is yet to be given final approval but points out its processes would not involve creation of tailings ponds. While admitting the process was "energy intensive", the company says 90% of water used would be recycled. It also insists it is committed to finding alternative energy sources, investing nearly £5bn in biofuels, wind and solar power. As the crowd outside its head office pipes up with another song, the cacophony permeates the office windows and causes bemused-looking staff to peer down. Whether their message gets through to the board - or will have any influence - remains to be seen.